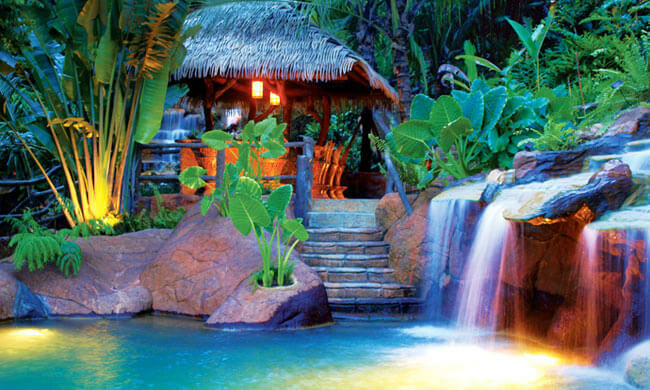 Explore Rainforest Full of Tropical Wildlife & Relax at Luxurious Hot Springs! Hike through 16 of Arenal’s state-of-the-art hanging bridges along a two-mile guided walk through primary rainforest. The 250-hectare reserve is home to an abundance of flora and fauna that your guide will point out and explain. With luck you’ll have a chance to see animals like howler monkeys and snakes, birds like parrots, orioles and toucans, and poison dart frogs. This excursion is a great way to learn about the natural history of the area and see some spectacular sights! After your hike, head to The Springs Resort to spend a couple of hours enjoying 18 luxury thermal hot springs—some of the most luxurious in the area—with temperatures ranging from 83 °F to 103°F. You’ll relax and relieve stress before heading for a wonderful buffet dinner at The Springs Resort. Your tour includes: transportation from/to your hotel, entrance fees, certified nature guide, dinner. What to bring: swimsuit, towel, change of clothing, raincoat, repellent, cash for additional drinks.